One Board Game, One Card Game, and One Video Game. I lead a group or "studio" of 10 people with an even mix in game designer and graphic designer and programmers. 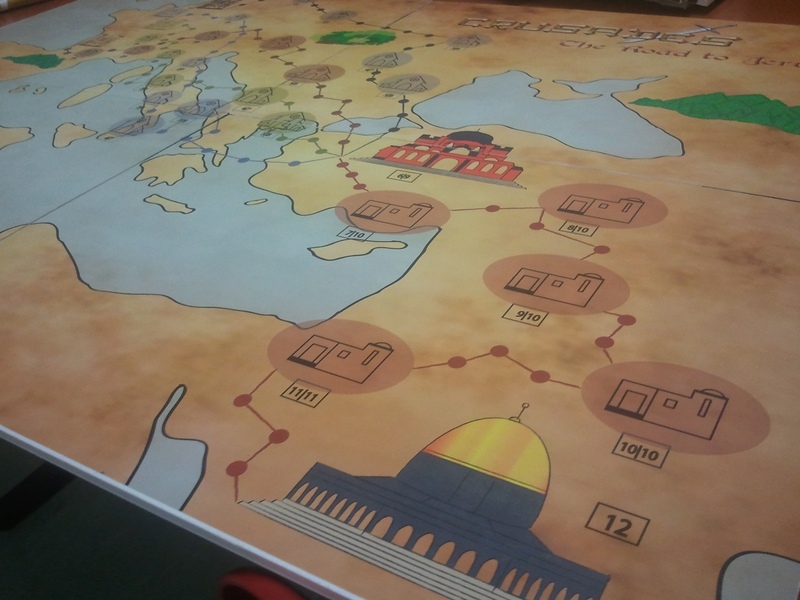 We had to design a game around a certain time period, ours were the Crusades. Each world was to have one board game, one card game and one video game based on the same narrative story line and visual language. For this project, I was the Producer/Lead Game Designer, responsible for coordinating and managing all aspects of the games assuring deadlines and milestones are met. I also had a hand at shaping the mechanics for all games. Below, you will find the board and card games. This game is based one the First Crusade, placed between 1095 and 1099 with the goal of reconquering the Holy Lands from the Saracens. 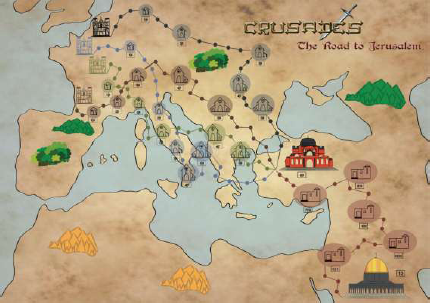 Based on the real map of Europe, we utilized real crusade routes with armies starting in one of four locations: Paris, Toulouse, Rousen or Boulogne. Movement & Resource: to move forward, players use resources. One resource = one space. The player is free to choose however many spaces they want so long they use the proper amount of resources. Players must move forward unless they are within a captured city or run out of resources. 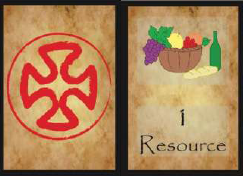 Front and back of a resource card. Players start the game with 45 resources. Capturing Towns: each town has a military defense representing capturing difficulty. The player may send up to three army units in attempt to capture the city. For each unit used, the player can roll one die but must use 2 resources. If the number rolled is greater than the city's defense, the player succeeds in capturing the town or else they must go back to the previous space and try again. 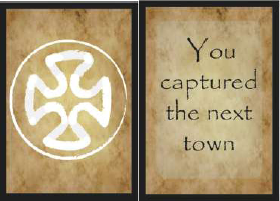 While in a captured city, players receive 15 resources and are able to continuously gain them by skipping their turn. Praying & Miracle Cards: miracle cards are only gained by "Praying" within a city. During a players turn, they may choose to roll a die. If a 3 has been rolled they may choose one miracle card. A miracle card gained only by "Praying". We printed the board on 4 separate pieces that would connect using magnets. 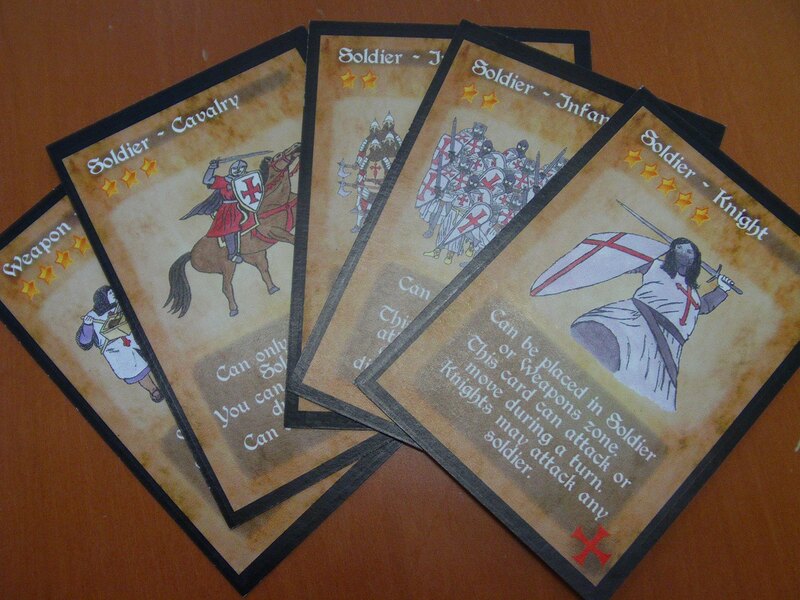 Each team will choose one of the two starter decks: Crusader or Saracen. Each card has a different attack value represented by stars. 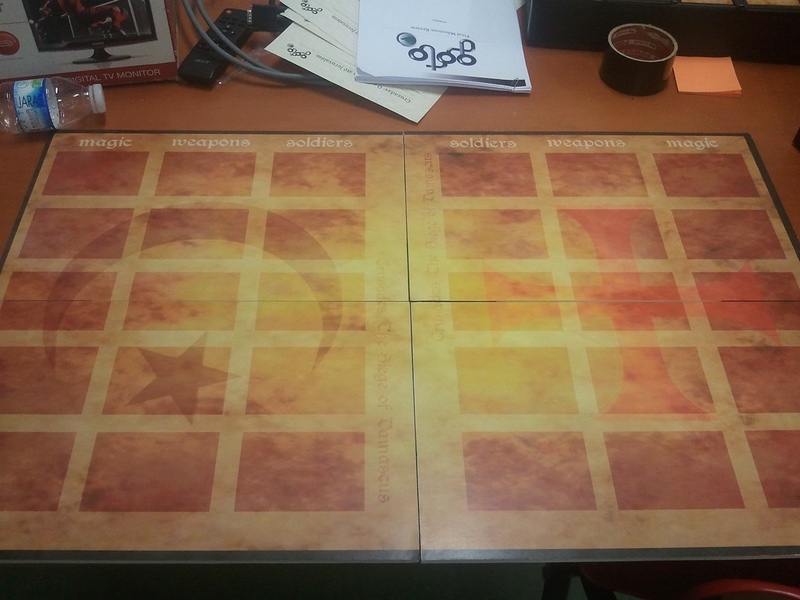 The game matrix, or “battle field”, consists of three rows, one for soldiers, one for weapons and one for special cards. On the field, both teams must place their 10 cards face down (soldiers and weapons). Each round is a between two cards. One player will choose their card and then their opponents to battle. The cards will then be flipped and star power will be compared. The card with the highest star power wins the round. Soldiers may only attack other soldiers; however, weapons may attack weapons and soldiers. 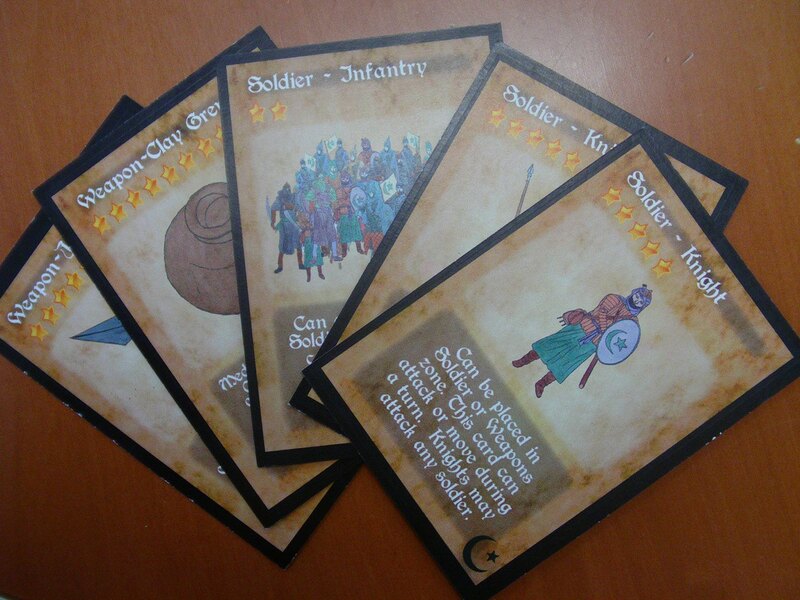 At any time the player may place a magic card to recover dead soldiers/weapons or to increase power.